Through six grueling years of warfare, USS Russell and her gallant crew pitted their prowess against a determined enemy. From the pre-Pearl Harbor Battle of the Atlantic to the campaigns in the Pacific, She was home to warriors who fought off attacks by submarines, planes and ships. She saw them through sixteen major engagements of World War Two including the Battles of Coral Sea, Java, Midway, Savo Island, Santa Cruz, and Guadalcanal She supported the land forces through the invasions of Tarawa, Kwajelein, and the New Guinea operations. She was part of General MacArthur’s return to the Philippines at Leyte and Lingayen Gulf. She protected Allied troops during the invasion and occupation of Okinawa. More than 1,200 survivors of bombed and torpedoed ships and crashed planes were pulled aboard her deck. And she brought the men who manned her armament and her engines back home alive. 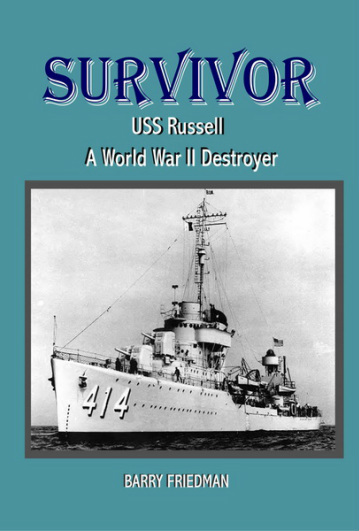 Russell survived the bloody conflict of the Second World War.